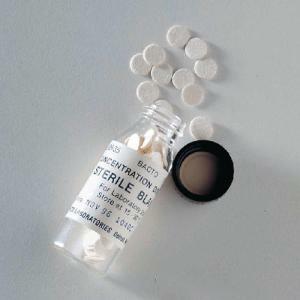 Easily observe the sensitivity of various bacteria and fungi to an array of antibiotics with these convenient kits, or test your own chemical using our blank discs. Each magazine contains 50 discs impregnated with antibiotic; all you need to do is place the disc on your culture, incubate and observe the results to determine susceptibility or resistance to specific antibiotics. A disc dispenser, required, is available separately. Dispenser for Sensi-Disc™ releases one antibiotic disc at a time from a Sensi-Disc™ magazine. Gram Positive Kit comes with one magazine of each of Penicillin, Erythromycin, Chloramphenicol, Novobiocin, Tetracycline, and Streptomycin. Ordering information: Refrigerate upon arrival.